A South African serial killer has been sentenced to life in prison for murdering 13 women. Thozamile Taki, 40, known as the sugarcane killer for dumping his victims' bodies in sugarcane farms, lured them with promises of jobs. 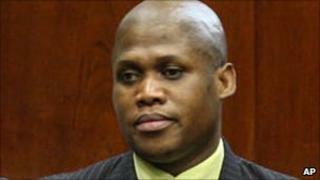 Sentencing Taki to life for each case, Judge King Ndlovu described him as a "jackal in a sheep's hide". South Africans have welcomed the sentence and praised the police's efforts, reports Sapa news agency. Relatives of the victims - some of whom had known Taki personally - cried and celebrated as Judge Ndlovu read his judgement in the Durban High Court on Wednesday afternoon. Judge Ndlovu said Taki's conduct during the trial had influenced his ruling. "Even when the families of the victims cried openly on the witness stand, you just smiled," he said. More than 100 people testified against Taki during the trial which began in early 2009. The women's decomposed bodies were found in sugarcane and tea plantations in Umzinto, KwaZulu-Natal and Port St Johns, Eastern Cape, in 2007. Taki has been denied leave to appeal against his sentence and is set to be transferred to a maximum security prison in KwaZulu-Natal.